Madrid is a fantastic city that could fill your days and nights with exciting discoveries, new corners to explore, tasty treats and lovely sights. But sometimes the ever-stimulating city streets call for a bit of a breather. And even if they don’t, even if you’re so enthralled by the mad city of Madrid that you never want to leave, there are a few quick day trips to beautiful towns around the capital city that are truly worth a visit. Check out some of our favorite day trips from Madrid and how to get there. Toledo will bring you back in time. Its winding cobblestone streets will lead you through the history of three different cultures elegantly woven together to create an ancient Christian, Muslim and Jewish town with Visigoth and Roman roots. Toledo is known for having been a space where these three cultures coexisted peacefully, making it a city brimming with interest and history. Explore the Cathedral and tip your head back in awe at the Gothic architecture and the stunning works of art by greats like El Greco and Velazquez; then take a tour of the Sinagoga del Tránsito for a look into Spain’s Jewish heritage, or the Mezquita del Cristo de la Luz to see the remains of a mosque from the time of Arabic rule. 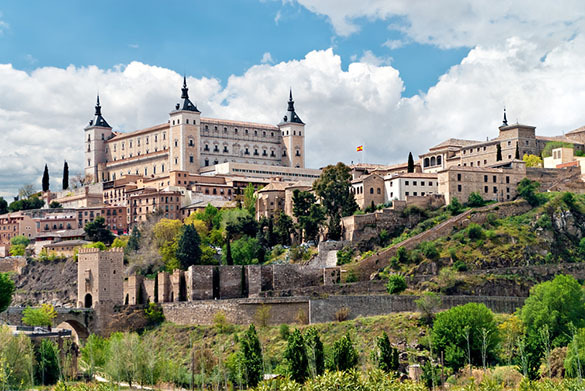 Don’t miss the famous El Greco Museum to see works by one of Spain’s most recognized artists (and a native of Toledo), then wander up to the Alcázar fortress, overlooking the city and the mote-like Río Tajo that surrounds it for a little lesson in history. Try the city’s famous marzipan and maybe even buy a handcrafted knife or sword commemorating Toledo’s artisanal past. Take the fast train and get to Toledo from Madrid in only 35 minutes (approximately). The bus is a great option for those on a budget who don’t mind a slightly longer ride. It takes about an hour and a half from Madrid to Toledo. **Keep in mind that both the bus station and the train station are a little outside of the city center. Take buses 5, 5D, 51, 61, and 62 from the train station or lines 5 or 12 from the bus station to the center (or take a walk – it’s about 15 minutes on foot). Segovia with its famous cochinilo (roasted suckling pig), the incredible Roman Aqueduct that might just make your neck ache as you gaze up at all its glory, the views of the arid Castilian landscape from the incredibly Disney-princessesque, stunning Alcázar, the absolutely beautiful Plaza Mayor, the Cathedral, the Palacio Real… the list goes on and on. 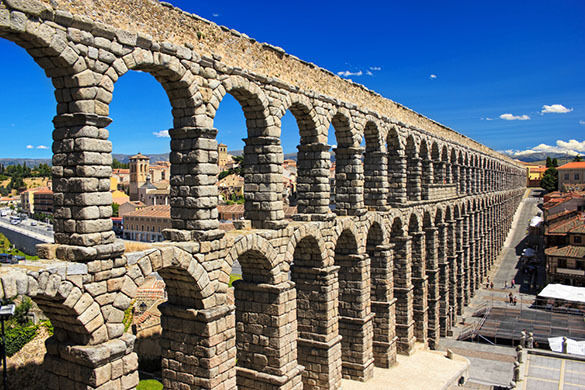 All of the sights to see and the great food to enjoy will leave you with a full day in Segovia. But even if you feel more like lounging, the city’s small town charm will enchant you from the moment you get there until the time when you grudgingly have to leave. This small city is definitely worth the short trip from Madrid. Take the fast train from Madrid and get to Segovia in only about 30 minutes. The bus from Madrid takes about an hour and fifteen minutes. *Make sure to choose a direct bus for an easier and faster trip. El Escorial is a spectacular small city to explore. The main attraction is the incredible monastery and for very good reason. The enormous building complex that holds the monastery is also used as a burial place (its incredible Royal Pantheon) for royalty beginning with Charles V in the 16th century when it was constructed, a royal palace, college and breathtaking library. Not to mention the grounds around the giant complex are filled with gardens, pools and plazas to explore. However, after you’ve finished the grand tour of the monastery, the rest of the city is filled with great restaurants for excellent Spanish (and other international) cuisine, little shops to stroll through and beautiful views of the surrounding countryside. Since it only takes about an hour to get there and is in the beautiful Guadarrama Mountains of Madrid, San Lorenzo de El Escorial is definitely a day trip from Madrid that’s worth making. Taking the train from Madrid to El Escorial is easy and leaves often from many stations throughout Madrid. It is a stop on the C-3 line of Cercanías (the close-to-Madrid train lines). Use the ticket machines or buy at the stations’ ticket offices. Buses #661 or #664 take about an hour from Madrid. Where to buy tickets: On the bus or at an estanco (tobacco kiosk) close to the bus station. There is a tobacco kiosk inside the Intercambiador de Moncloa metro/bus station (make sure to have cash to pay at the estanco – sometimes they don’t accept credit cards – and close to exact change to pay on the bus). 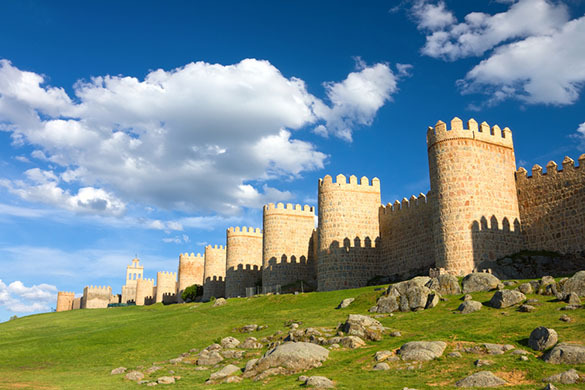 Ávila is a gorgeous little medieval town and the perfect place to feel like you have wandered into a fairytale or at least back to the Spain of old, where castles, walled cities, kings and cathedrals dominated the landscape. It is home to Santa Teresa de Ávila and has an astounding number of churches, monasteries and convents exhibiting beautiful Romanesque and Gothic architecture. But the city wall, the most intact and complete in Spain, is the real stunner, and especially at night when it is illuminated with golden lights. Don’t miss the Puerta del Alcázar to experience the wall in all its glory. And after getting your fill of walking to see all of this UNESCO World Heritage city’s sights, don’t forget to try some of its traditional treats like yemas de Santa Teresa, a sweet made with egg yolks and sugar, or the many recipes made with judías de El Barco de Ávila (beans from the region). The train from Madrid to Ávila takes between an hour and forty minutes and a little over two hours. The bus to Ávila from Madrid can take anywhere from about an hour and twenty minutes to two hours. Of course the capital of Spain is an incredible city to explore and could keep you entertained for as long as you’re in the country. 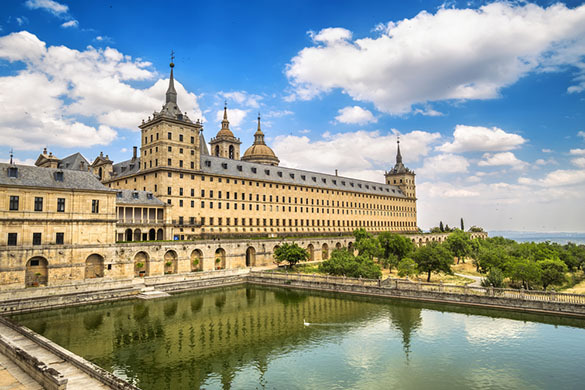 But some of these day trips from Madrid are not only easy, they are to some of the most beautiful small cities and towns in Spain, they can be made easily in a day and they will inspire you with their beauty, history and culture. Posted August 9th, 2016 by amerispan amerispan & filed under Study Abroad Tips, Travel News & Info.